Road Test magazine said in 1954 that "on roadability and responsive handling, the Met shines. It also offers easy maintenance and downright stinginess when it comes to gasoline consumption. Also, it's literally a brute for punishment. On several occasions I took familiar corners at speeds half again what I would dare to use in some cars of twice the weight – proof that proper weight distribution, low center of gravity and well engineered suspension have more to do with roadability than massiveness, weight and long wheelbases. Admittedly, the short wheelbased Met does pitch moderately on very rough roads, but the sensitivity and ease of steering make driving a pleasure." Production at Austin's Longbridge factory started in October 1953 (Commencing VIN1001). Nicknamed the "baby Nash", the cars were tiny. They had an 85 in (2,159 mm) wheelbase, overall length of 149.5 in (3,797 mm) and a gross weight of only 1,785 lb (810 kg) for the Convertible and 1,825 lb (828 kg) for the Hardtop, thus making the Metropolitan smaller than the Volkswagen Beetle. The two models, a convertible and a hardtop, were powered by the OHV 1,200 cc (73 cu in) straight-4 Austin 'A40' series engine (as used in the Austin A40 Devon/Dorset) driving the rear wheels through a three-speed manual transmission. The initial order was for 10,000 units, with an option to increase the order if sales were sufficient. In Dec.1953, George Mason took two Metropolitans to Raleigh Speedway in North Carolina for some tests. The first Metropolitan did a 24-hour endurance run, going a total of 1,469.7 miles (2,365 km) without the need for a tune up, while the second car was put to a 24-hour fuel economy run. It averaged 41.7 mpg‑US (5.64 L/100 km; 50.1 mpg‑imp). November 1955 saw the start of Metropolitan Series III (NK3) production (Commencing with VIN E21008 on 28 November 1955). A redesign at this time saw the Metropolitan's B-Series engine increased in capacity to 1,498 cc (91.4 cu in) (as used in the Austin A50 Cambridge). Polished stainless steel sweep-spears on the body sides allowed a new two-tone finish to be incorporated, which had the cosmetic effect of lowering, slimming and lengthening the car. The new exterior colors were P905 "Caribbean Green", P910 "Sunburst Yellow", and P911 "Coral Red" with P909 "Snowberry White" as a contrast. The grille was also redesigned, and the hood had its non-functional hood scoop removed. 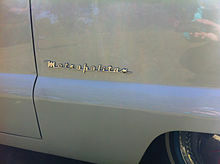 American Motors changed the designation to "Metropolitan 1500" to differentiate it from the earlier 1,200 cc (73 cu in) models. The interior was also changed to incorporate a "houndstooth" check material for the seats trimmed with white vinyl. The dashboard was also now painted black, rather than the body color as was the case for Series I and II Metropolitans. January 1959 saw the start of Metropolitan Series IV (NK4) production (Commencing with VIN E59048 on 12 January 1959). This major redesign saw the addition of an external decklid (previous models only allowed access to the trunk through the rear seat back) and vent windows. 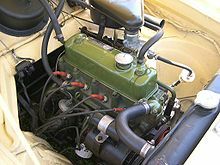 By this time, the engine had been upgraded by increasing the compression ratio from 7.2:1 to 8.3:1 (Commenced VIN E43116 — October 15, 1957) giving an output of 55 bhp (41 kW) (as used in the Austin A55 Cambridge). The additional features added 15 lb (6.8 kg) to the weight. Exterior color options were the same as for Series III. The interior now used a diamond pattern for the seats, with white vinyl trim. The MSRP for Series IV models was $1,672.60 (Hardtop) and $1,696.80 (Convertible). To establish the production date for a Metropolitan (U.S. and Canadian models only), check the VIN or Serial number on a data plate affixed to the firewall. Chassis numbers after 4781 are prefixed by the letter "E". Check this number against the list below, to establish an approximate production date. NB. Since the cars took at least six weeks to be shipped from the Longbridge factory to the U.S. distribution network, the actual titled date will not be the same as the production date. 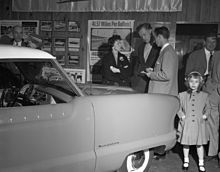 Faced with increasing competition from AMC's own Rambler American models, as well as newly introduced compact cars from the Big Three, the Metropolitan lost market appeal. The last Metropolitan body was made by Fisher & Ludlow on 10 April 1961. US-bound Metropolitan production ended in April 1961, as a result of its "marginal sales plus the fact that a four or five passenger Rambler American could be purchased for only about $100 more". The "Metropolitan's staying power and its never-ending cuteness" have earned it "a place among the Greatest Cars of All Time" in the opinion of automotive writer Jack Nerad, a former editor of Motor Trend magazine: "No, the Metropolitan didn't come from a top-of-the-line manufacturer. No, it doesn't have a proud racing history. And, no, it wasn't built in huge numbers. But [it] possesses an ageless, cuddly quality that has made it a perennial favorite of car lovers and car agnostics alike." Nerad added: "If you wanted to ... wring the Met through its paces, you would be rewarded with a 0–60 miles per hour acceleration time of nearly 30 seconds. The Met was reasonably light at approximately 1800 pounds, but that weight was squared off against 42 horsepower." In the opinion of syndicated auto journalist and author Bill Vance, the 1,200 cc (73 cu in) Metropolitan "was quite a stylish little car" that was "ahead of its time" and performed well against its competition. Brian Sewell cites the 1,500 cc (92 cu in) version as the one "now perversely recognized as a collector's car", and says that the Metropolitan is "worth a moment's consideration, for in the history of the post-war American car industry it was the only genuine attempt to provide the market there with a mass-produced small, cheap car that could hold its own in urban traffic and slot into parking spaces far too small for even the smallest Ford or Chevrolet ... [but] the steering, dreadfully hampered by the enclosure of the front wheels, is so insensitive, and the turning circle so wide, that parking is a wretched business, the slack response of the huge steering-wheel a feature common in lumbering US cars of the period." One marque enthusiast says that Nash’s subcompact was "the Smart car of the '50s." Although his Metropolitan is unsuitable for long journeys owing to "a lot of wind noise and really poor suspension," it can cruise at 50 mph (80 km/h) and has a top speed of 75 mph (121 km/h). Parts are "relatively easy" to obtain and the car is "easy to work on." Sewell advises buying the open version in "as late a model as you can (it ceased production in 1961) – this has slightly more panache, and with the hood down it's much easier to load [at the supermarket]." "While there are still good deals to be had on Metropolitans, their values have quietly but sharply escalated in the last five years while other 1960s American collector cars have leveled off or simply remained flat ... Parts and support are not a problem with these cars; returning all the waves and smiles you'll get driving a Met can be tiring though." The Metropolitan's unique look has earned it several appearances in films and TV, often driven by nerdy or eccentric characters. "Weird Al" Yankovic drives a 1959 Metropolitan in the film UHF. Kevin Bacon's struggling filmmaker character in 1989's The Big Picture drives a beat-up 1954 Metropolitan. In the 1995 film Clueless, Cher's eccentric gay friend Christian drives a 1954 Metropolitan. Prop comic Carrot Top drives a 1956 Metropolitan in his film Chairman of the Board. In the Pixar film The Incredibles, Bob Parr is relegated to driving a 1956 Metropolitan station wagon (which he has trouble fitting in). In the 2007 film Nancy Drew, the title character drives a 1956 Metropolitan. ^ "1954 Nash Metropolitan Foldout". Oldcarbrochures.com. pp. 4–5. Retrieved 25 January 2013. ^ "1954 Nash Metropolitan Foldout". Oldcarbrochures.com. pp. 7–10. Retrieved 25 January 2013. ^ Gross, Ken. "Modern Classic: Nash Metropolitan". automedia.com. Retrieved 17 February 2012. in 1950–51, Nash circulated 250,000 questionnaires nationally asking: "Does American want the economy car—"
^ Foster, Pat (October 2005). "Developing the Metropolitan". Hemmings Classic Car. Retrieved 17 February 2012. ... Mason began to explore the idea of developing a truly small car, the size of what today we'd call a subcompact. ^ a b c Foster, Pat (October 2005). "Developing the Metropolitan". Hemmings Classic Car. Retrieved 17 February 2012. ^ "America's Smallest Car – the Metropolitan". Popular Mechanics. 101 (4): 88–90, 260–262. April 1954. Retrieved 17 February 2012. ^ Auto Editors of Consumer Guide (24 July 2007). "1954–1956 Nash Metropolitan Series 54". auto.howstuffworks.com. Retrieved 17 February 2012. ^ a b Foster, Patrick R. (1998). The Nash Styling Sketchbook. Olde Milford Press. p. 2. ISBN 978-0-9662019-0-1. Retrieved 17 February 2012. ^ a b c Fitzgerald, Craig (October 2005). "1961 Nash Metropolitan Convertible". Hemmings Classic Car. Retrieved 17 February 2012. ^ "Sales brochures (various years)". Metropolitan Library Web-Site. Retrieved 17 February 2012. ^ "Metropolitan is a Good Thing in a Small Package, Say Owners". Popular Mechanics. 102 (5): 118–122, 248. November 1954. Retrieved 17 February 2012. ^ Clymer, Floyd (November 1954). "Clymer Road Tests the Metropolitan". Popular Mechanics. 102 (5): 119–250. Retrieved 17 February 2012. ^ Foster, Patrick R. (2002). The Metropolitan Story. Olde Milford Press. p. 100. ISBN 978-0-9662019-1-8. ^ Collectible Auto:65 April 1990. ^ a b Vance, Bill (8 September 2006). "Motoring Memories: Metropolitan, 1954–1962". Autos Canada. Retrieved 25 January 2013. ^ "Vor 20 Jahren: Erster US-Kleinwagen (a page of extracts from the same magazine's edition of exactly twenty years earlier)". Auto, Motor und Sport (in German). 9: 21. 27 April 1974. ^ a b c "1954 Nash Metropolitan Foldout". Oldcarbrochures.com. pp. 2–3. Retrieved 25 January 2013. ^ a b Auto editors of Consumer Guide (23 October 2007). "1954–1962 Metropolitan". Retrieved 17 February 2012. ^ "Regal Met". About the Metropolitan. NashMet.com. Retrieved 17 February 2012. ^ a b Merlis, Bob (December 1996). "Size Matters – Nash Metropolitans aren't just cute cars, they're a way of life". Los Angeles Magazine. 41 (12): 37–38. Retrieved 17 February 2012. ^ "Arbib Company". Modern Metals. 12: 48. 1956. Retrieved 11 April 2013. ^ Hess, Jeffrey P. (March–April 2000). "An Interview with Richard Arbib". HR Watches. Archived from the original on 18 July 2010. Retrieved 11 April 2013. ^ "Astra-Gnome: $?". Popular Science. 169 (1): 112. July 1956. Retrieved 11 April 2013. ^ "Yes, it's a Metropolitan!". The Metropolitan Pit Stop Museum. Retrieved 17 February 2012. ^ Custin, C. "History of MOCNA". Metropolitan Owners Club of North America. Retrieved 17 February 2012. ^ Foster, Patrick R. (2002). The Metropolitan Story. Olde Milford Press. p. 98. ISBN 978-0-9662019-1-8. Retrieved 17 February 2012. ^ Nerad, Jack. "The Greatest Cars: Nash Metropolitan". Driving Today. Archived from the original on 8 February 2012. Retrieved 17 February 2012. ^ a b c Sewell, Brian (26 June 2007). "Nash Metropolitan 1954–1962". The Independent. Retrieved 11 February 2013. ^ a b Rooney, Robert K. (11 January 2008). 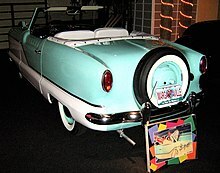 "The original smart car: Nash Metropolitan one of first compacts built". Calgary Herald. Retrieved 11 April 2013. ^ a b Gross, Ken. "Modern Classic: Nash Metropolitan". automedia.com. Retrieved 17 February 2012. ^ McNessor, Mike (July 2011). "1954–1962 Metropolitan: This cute Brit is in demand with collectors". Hemmings Motor News. 58 (7): 32. Retrieved 11 April 2013. ^ "About the Metropolitan". nashmet.com. Retrieved 17 February 2012. ^ Strohl, Daniel (5 January 2007). "Metromobile". Hemmings Blogs. Retrieved 17 February 2012. ^ Sass, Rob (June 2008). 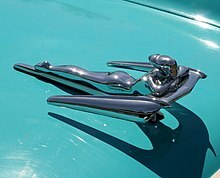 "Nash's "Mini Me" for '53". Sports Car Market magazine: 37. Retrieved 25 April 2016. ^ Sherlock, Joseph M. (9 January 2009). "The View Through The Windshield". Retrieved 25 April 2016. Greg Gutfeld is a car guy. About his 1953 Nash Metropolitan, he wrote: "I always wanted one of these cartoonish cars, and got one - making me an owner of two absurd automobiles". ^ Long, David (2007). Little Book of London. The History Press. p. 28. ISBN 9780750948005. Retrieved 25 April 2016. Princess Margaret once owned an unusual black convertible nash Metropolitan, but it was stolen by a fourteen year-old schoolboy. ^ Gerard, Jasper (19 August 2010). "Classic Austin/Nash Metropolitan". Telegraph. Retrieved 25 April 2016. Princess Margaret was presented with one as a wedding present. ^ Foster, Pat (April 2006). "Jay Leno, Paul Newman, and Me". Hemmings Classic Car Magazine. Retrieved 25 April 2016. ^ Mort, Norm (2010). Anglo-American Cars: From the 1930s to the 1970s. Veloce Publishing. p. 90. ISBN 9781845842338. Retrieved 25 April 2016. Actor and famed international racing driver Paul Newman and his film star wife, Joanne Woodward, owned a Met. ^ "Elvis song sheets and scripts lost in California fire". Breaking News IE. 25 October 2007. Retrieved 25 April 2016. However, firefighters were able to save Presley's Nash Metropolitan car and his US Army jacket before the flames swept in. ^ "BMC Worldwide News Exchange – They use our cars". Metropolitan Library Web-Site. 1957. Retrieved 25 January 2013. Foster, Patrick R. (2002). The Metropolitan Story. The Olde Milford Press. ISBN 978-0-9662019-1-8. "History of Metropolitans". Retrieved 11 April 2013. 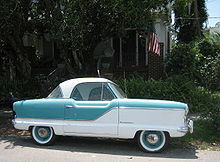 Wikimedia Commons has media related to Nash Metropolitan.